You’re getting married hey? Congratulations! Now all you have to do is organise an awesome event which reflects your personality, hopefully doesn’t send you broke, and that all your family and friends will be raving about for years to come. So, all you really need to worry about is (deep breath): The date, The venue, food & beverages, photographer, videographer, the guest list, invitations, seating plan (family politics), flowers, the wedding cake, the wedding dress, the suits, styling, budgeting, dieting, travel arrangements, accommodation, choosing a band…and the list goes on. Simple right? Unfortunately we can’t help you with a lot of what we listed above. However, we can definitely help you with the music! We may be biased, but we think getting the music right will help enormously in making sure the whole event is a success. Read on for our Super Duper 5 Minute Guide To Wedding Music 2018! Note: Rules are made to be broken – so please feel free to ignore all of our advice. It’s your wedding after all! Every wedding is unique and special right? This is true, BUT after playing at hundreds of weddings we can tell you that there are some universal guide lines which, if followed, could help your big day run smoothly. Most wedding receptions in Australia will start at around 6pm and conclude around 11 or 11.30pm. In this period of time there are usually quite a few things that need to happen: Everyone has to eat, there needs to be introductions, speeches, cutting of cake, dancing, and farewells. And everyone has to have a great time! Typically a band like us will approach the night in two halves (roughly speaking), the first half we are there to create atmosphere, play light dinner music, and more or less stay out of the way. The Second half of the night is very different, it’s PARTY TIME, and your band or DJ needs to bring the party. Big Time. We commonly play 2 big party sets starting at around 9pm (of 45 minutes each) and play dance floor fillers in between with our DJ service. See below for some “Golden Rules” for structuring your wedding reception. You should have all meals and formalities finished by 9pm. Then it is PARTY TIME. Your guests have been very polite and civilised for a few hours now, and you need to let them loose. Weddings are a celebration after all and you need at least two hours free from formalities to let the party roll on. Do not do your first dance as soon as you enter. It’s too awkward, and the room hasn’t been “warmed up” enough yet. For most couples at least one of them is very nervous about the first dance, so we suggest doing it later in the night when everyone is a bit more relaxed (see golden rule 4 for more details). If you want to get something out of the way at the beginning of the reception we suggest cutting the cake might be a better option. Speeches should go for a MAXIMUM of 30 minutes. You might have the most interesting speakers in the history of human kind. But guess what? Your guests do not care. If they go on too long, people lose interest. And it cuts into dancing time. Also, consider that people usually have been drinking alcohol for a couple of hours by now…so maybe use the capacity of the human bladder as your guide. You should start a dance bracket with your first dance (bridal dance). This is an excellent way to kick off the dance floor. Simply invite your guests to join you at the end of the bridal dance. It works every time! Note that this doesn’t have to be one of the last two sets which start at 9pm. Quite often there will be a short dance bracket directly following the speeches and first dance, which then leads into dessert. Having a short dance bracket like this actually works really well as a dance floor ice breaker before the party really gets going later in the night. Have a farewell circle or similar. It’s a great moment of togetherness and an opportunity for you to thank your guests and vice versa. It’s also the only time some of your guests will set foot on the dance floor. If a farewell circle isn’t to your taste then don’t call it a farewell circle. Just get everyone on the dance floor for one last song! The musicians you hire should work around what is happening at your event – not the other way around. This is particularly important early in the evening. 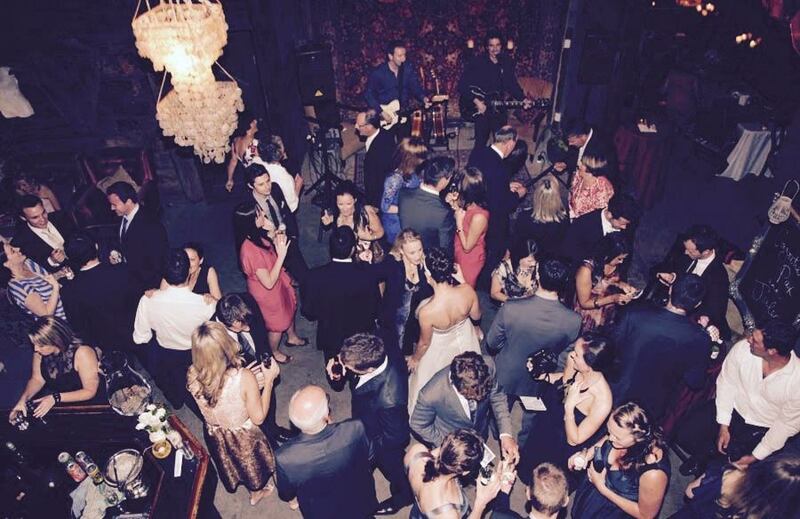 You should never have to wait for your band or DJ to finish their set – it’s your wedding, not their gig. Ask your MC to coordinate with the band, and you’ll have no problem. Or even better, ask your band to MC. Playing music at weddings is very different to playing gigs at the pub. I could go into all the reasons why, but this is a 5 minute guide, so you’ll just have to trust me. We have heard many stories of couples who have chosen their favourite local band only to find that even though they were a great band, they just weren’t right for the job (I have actually been in one of those exact bands when I was much younger, and it was terrible – we weren’t right for the job, and it became very obvious very quickly). They are quite often too loud, don’t have an extensive enough repertoire, or don’t understand how to structure their performance. If you choose an act with significant wedding experience (like us!) then you can rest assured that we know exactly what to do at your wedding and can adapt to nearly any situation that may arise on the night. We can even help you plan your running sheet if you would like some advice. I don’t know if this needs much explanation. But when the bride and groom hit the dance floor, good things always happen. Even if you HATE dancing (we’ve seen some grooms who look like they’d prefer to be at the dentist than on the dance floor). But if you just make a small effort and dance to a song or two, it makes a big difference to the vibe. Seriously dude, just dance to one song. 4. By all means tell your band or DJ what music you like, but for the love of God, do not choose every single song. This last rule might be hard to swallow for some. But I have some shocking news for you. Ready? You probably aren’t that good at choosing music. Sorry. Presuming that you have chosen a band/DJ with lots of experience, part of what you are hiring them for is their judgement. We ask our brides and grooms to choose a few DO and DON’T play songs from our list and then let us choose the rest on the night. The reason we do this, is because we have played at hundreds and hundreds of weddings and events, and we back our experience to play the right song at the right time. At most weddings there are people of all ages and with varying tastes in music – and your band needs to react to what is happening on the dance floor. A strict list of songs can be a severe hindrance to this process. We have had situations in the past where guests are begging us for a particular song and we can’t play it because the bride and groom have banned it. Most bands and DJs have a lighting rig these days, but we’ve seen some pretty poor displays. Ask them about their lighting before you book and check out their photos online. Awesome party lights make a big difference to the atmosphere of your event. Also, ask your band if you can use their microphones for speeches. We provide a wireless mic for speeches, have top of the range lighting, and enough equipment for multiple set ups. So there it is – the Brightside Duo 5 minute guide to wedding music 2018. Of course you should feel absolutely free to ignore all of our tips and advice. Rules were made to be broken! If you have some fresh ideas for your wedding music we’d love to hear them! Get in touch today if you would like to discuss your wedding or event.